The Calgary ATV Riders name may be a new, but our lifetime members have been riding throughout Alberta for more than 20 years. In the early 1990’s the Rebels were bringing together a group of individuals who loved to ride and have fun. They organized rides and camping events for new and existing members. In May of 2006 the Ghost Public Land Use Zone (PLUZ) came into effect and in response to the restrictions placed on the trails in the Ghost Waiparous area the Calgary Quad Squad was established as a non-profit organization as a chapter of the Crowsnest Pass Quad Squad (CNPQS). The Calgary Quad Squad worked hard in the first few years building a relationship with the Alberta Off-Highway Association (AOHVA) and the Sustainable Resource Development (SRD) and is now known as a club with integrity and a provincial leader in the community that is environmentally conscious and a defender of multi-use trails. 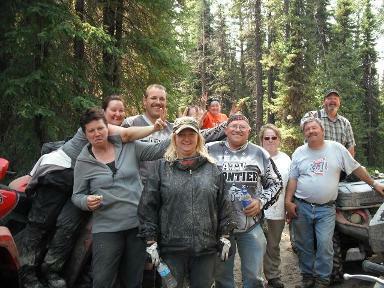 On May 1st 2009 the Calgary Quad Squad officially changed their name to The Calgary ATV Riders Association. This name change was to enable the Calgary club to individually access federal and provincial grant funding without impacting other grant opportunities for the CNPQS. In the past year we have created our own logo, pamphlets, website and clothing apparel that we are very proud of. Our stewardship initiatives have grown from a single bridges to over 30 bridges built in the past 4 years and the redevelopment and sustainability of over 50 km of trails in 2009-2010 in the Ghost PLUZ area and we look forward to expanding our initiatives in 2017 while working in conjunction with the other organized active off-road users. Join us in 2018 for fun and adventure as we have a rides scheduled in various areas throughout southern Alberta. In November we will hold our 14th Annual Rebel’s Ride honouring the group of riders who have made the Calgary ATV Riders possible today.